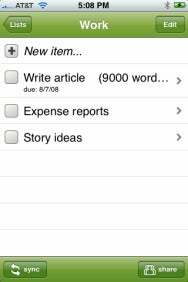 My recent round-up of the best of the basic to-do apps for iPhone and iPod touch, which focused on simple apps for tracking lists of tasks, omitted Robert Kieffer’s free Zenbe Lists 1.2. Also a basic to-do tracker, Zenbe Lists has two features that set it apart from those other apps: online syncing and sharing. As a standalone to-do list app, Zenbe Lists is straightforward and easy-to-use. It lets you create multiple lists of tasks—which it calls Items—using New List and New Item buttons that appear at the top of the main and list screens, respectively. Tap on an item’s box to mark it as complete. You can remove an item completely using the Edit button or the familiar swipe-delete gesture. 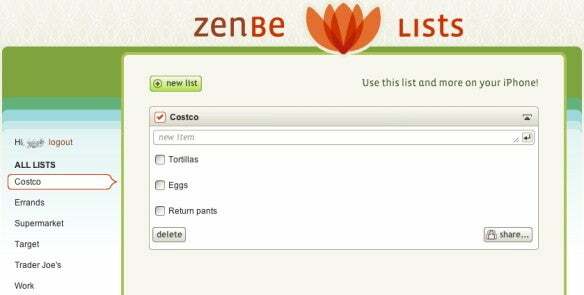 Zenbe Lists lets you manually reorder items in a list, as well as reorder the lists on the main screen. You can edit any list name or item after creating it, although you can’t move an item from one list to another. Zenbe Lists also supports due dates for items; although there are no audible or visual alarms, an item’s due date is displayed in smaller type below the item’s name. Finally, although you can’t add a separate note to an item, the item-name field is large enough to accommodate lengthy notes; one drawback to this approach is that the beginning of your note will appear in the list view (as shown for the "Write article" item in the screenshot below). Zenbe Lists offers, via its settings screen, a few options: font size, whether or not checked-off items are automatically moved to the bottom of the host list, and the ability to use landscape mode. Unfortunately, these options aren’t located within the app itself; they’re found in the iPhone’s Settings app, so you have to quit the app and switch to Settings to make any changes, then switch back to Zenbe Lists. What sets Zenbe Lists apart from other basic to-do apps is that once you set up a free account at the Zenbe Web site, and then enter your username and password in the iPhone app, you can sync and share your lists online. On the data-safety side, this means that a simple tap on the Sync button in the iPhone app saves all your lists on the Zenbe site. (You can even choose, via the app's settings, to automatically sync whenever you launch the app.) If your phone is ever stolen or needs to be restored, you don’t have to worry whether iTunes’ unreliable backup feature will work; you can easily sync your lists back to your iPhone. After experiencing several iPhone restores that didn’t restore my data, I no longer personally use a to-do-list app that doesn’t sync, either online or with an app on my Mac. But there are also other compelling benefits of online syncing. Tap the the Share button in Zenbe Lists on your phone, and an e-mail message is created containing a special Zenbe link; anyone with an iPhone or iPod touch with Zenbe Lists installed can click on that link in Mail to load your list in their copy of Zenbe Lists. If they have their own free Zenbe account, they can edit the list and sync their changes, as well. These two sharing options—Web and iPhone—make Zenbe Lists ideal for lists that need to be accessible and editable by multiple people. A perfect example of this, visible in my screenshots here, is a shopping list. 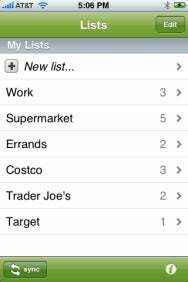 I’ve set up separate lists for stores my family shops at regularly; everyone in my household can access those lists, using either Zenbe Lists on an iPhone or iPod touch, or via bookmarks in a Web browser. Whenever anyone adds an item to a shopping list, that list is instantly updated online—everyone else sees the update immediately. Which means no one has to figure out who has the latest paper list or where it's hidden in the house. Even better, it means that I can actually be at the supermarket when my wife remembers that we need sun-dried tomatoes; a quick tap on Sync before I check out shows me the newly-added item. If you don’t need advanced task-management features, Zenbe Lists provides an easy-to-use solution for tracking multiple lists of to-dos. But it’s the app’s online syncing and sharing features that have earned it a permanent spot on the iPhones and iPod touches in my house. For the low, low price of free, you can sync your lists between multiple devices and share them on the Web, making Zenbe Lists perfect for simple shared lists, such as those you’d keep for shopping and household to-dos. Updated 8/8/2008 3:05pm Corrected information about list sharing. Zenbe Lists is compatible with any iPhone or iPod touch running the iPhone 2.0 software or later.